At 2,700 pounds, the Subaru BRZ (Scion FR-S/Toyota GT-86) is one of the most lithe RWD performance cars on the market today. It’s just too bad it puts out only 200 horsepower. But Weapons Grade Performance in Connecticut is looking to fix this by swapping out the four-cylinder boxer engine with a hairier 6.0L LS2 engine straight out of a Pontiac GTO. The heart transplant is expected to add some 200 extra pounds, but with the big V8 pushing out some 400 stock horsepower, it’s kind of hard to care. As far as the world knows, this project still has some ways to go, but we can’t wait to see what the finished product will look like. Now, if only GM would put the Chevrolet Code 130R into production, then we might actually see something like this from the factory. Well there goes the balance. 250hp in that little car is the sweet spot in my opinion. The Boss 302 > GT500 for the same reason. That car just became a dive bomber. Am I the only one who thinks this looks photoshopped? The engine looks small and not centered. The block itself is small compared to most engines, but you’re right about it not looking centred. I call this a shop until I see more. who says an engine has to be on center? or how about transverse mounted engines? or mounting on an angle? if you can dissect that photo and show me where it is photoshopped i’ll side with you, maybe. That’s an Amanti, a FWD car with a Longitudinal engine cover. It says nothing of the position of its driveline. Unless you can see an engine componet that reflects the driveline, a plastic engine cover will tell you nothing. Letter to the Author: If Chevy is going to produce the 130R, they should also give the Tru 140S a shot. I’d pick that up in a heartbeat, too bad its not RWD though. 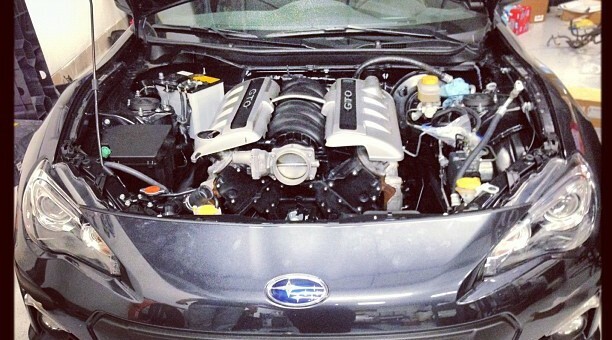 The BRZ doesn’t need an LS. It needs a 2.0 turbo. This is awesome! I currently own a stock ’13 frs and told myself once I get my BSN that I would engine swap it and this is more motivation.